The Dolphins would only end up interviewing six candidates because the Dolphins backed out of their request with Fangio and Munchak declined the interview offer. I liked that the majority of the candidates were defensive-oriented because I feel that is where you start in the rebuild process. It’s why I had Bieniemy and Loggains low on the list. I know there was a select group of fans who wanted Bieniemy and were hoping for an Albert Wilson reunion but Bieniemy was too much of the same guy the Dolphins had hired in the past so I wouldn’t have been that thrilled to get him. As for Loggains, goodness! He was sort of a last-minute surprise to get an interview which tells me that maybe the Dolphins just wanted to pick his brain a bit and get his two cents on what went wrong during the Gase regime. There was another group of fans on social media that were hyped for Vic Fangio. I found myself begging for this to not to happen because it really would have been like going back to 2012 all over again. For example, Ross gets rid of the Sparano regime but keeps Ireland much like how he has handled the situation with Grier now. Then we hire this old-timer coach who hasn’t been a head coach before and hasn’t really had people knocking on his doors for jobs, but the Dolphins feel like this could be their guy. That’s how it was with Joe Philbin. So, it just seemed like 2012 all over again. You know I was really hoping this time around that Ross would hire a coach with some previous experience of what it was like to be a head coach. Or at least getting some gumption and going after the guy you really want. If you think John Harbaugh is the answer, find a way to get him to Miami. Work out a deal with the Ravens. Throw in a first-round pick with the Ravens for him. That’s not enough? Give them cash! Do something! Instead of settling for something less. Granted Dennis Allen didn’t have a good first-go around as the head coach of the Oakland Raiders, but it has been five years! You would think he would have learned something by now. I think he did because the Saints were fourth in total team defense this past season. I don’t follow the Raiders so I don’t know what happened but honestly, I would have been perfectly happy with this candidate. Mike Munchak made me a little nervous because he was an offensive line coach and we have already had our fill of those type of coaches in Sparano and Philbin but this wouldn’t be his first rodeo either so I would be fine with it. Turns out he declined the Dolphins so there was no chance for me on that one. The only rookie head coach I would have made an exception for is Darren Rizzi because one, I am a fan of his, and two, we have familiarity with him unlike most of the other candidates. 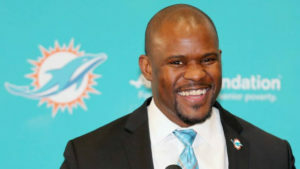 After about a week into the coaching search, the Dolphins had decided between Kris Richard and Brian Flores. The reason I had Flores ranked above Richard is because I don’t believe you got to bounce around to pad a resume. I hate the Patriots, but you have to acknowledge what they have done and the fact that he has been with them so long, I believe is a strength not a weakness. Just taking into the fact, both the press conference of Grier’s introduction as the new Executive Vice President and the press conference introducing Flores as the new Head Coach, it looks like the experimentation isn’t over. Again, Flores is going to have a chance to prove me wrong which I hope I am but I’m not going to get out my pom-poms over this hire. I am a Miami Dolphins fan for life. When I cheer for the Dolphins, I am one with the universe. But, at what point, do we ask ourselves, “when are they going to get a real coach?” Instead of a coach, you think could be a head coach? That’s what I want to know.